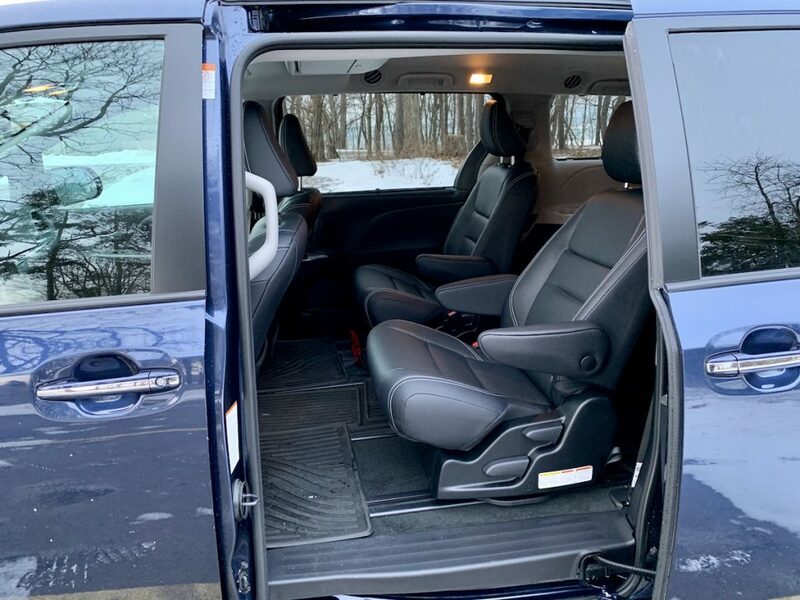 With the crossover craze in full effect, many often forget that the most functional vehicle that can haul a lot of people, cargo, or both simultaneously, is a minivan. 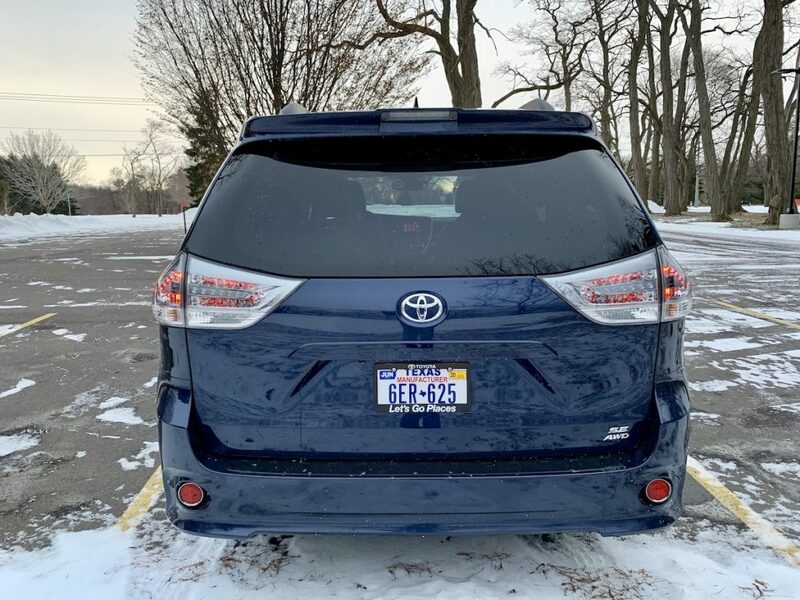 The Toyota Sienna has been around for many generations now and continues to be the most sensible option, especially with AWD. 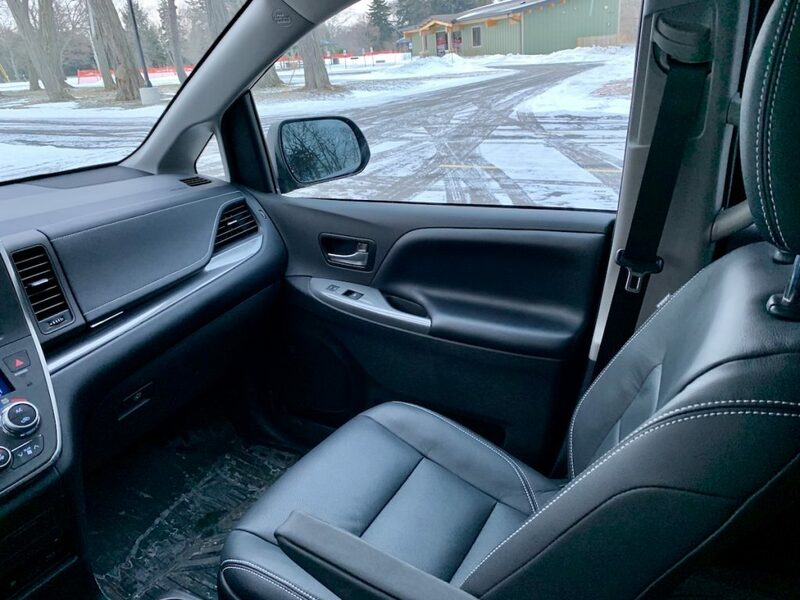 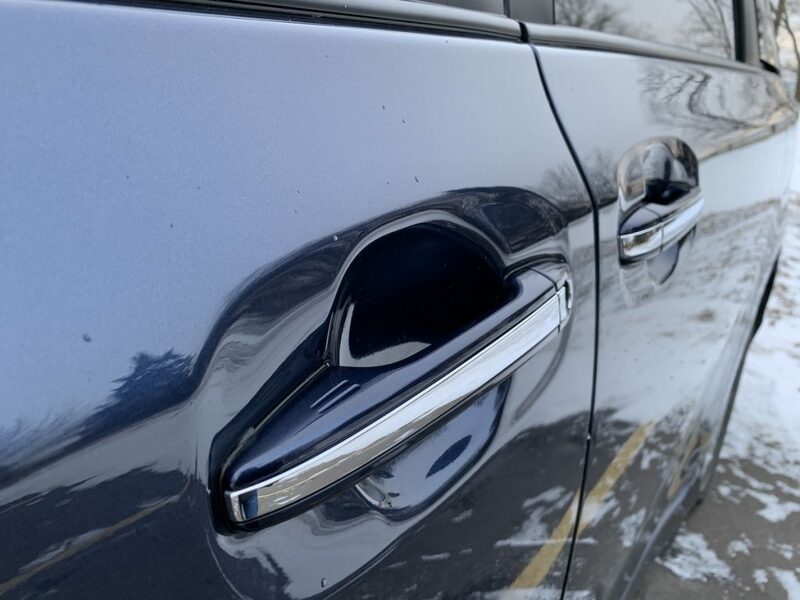 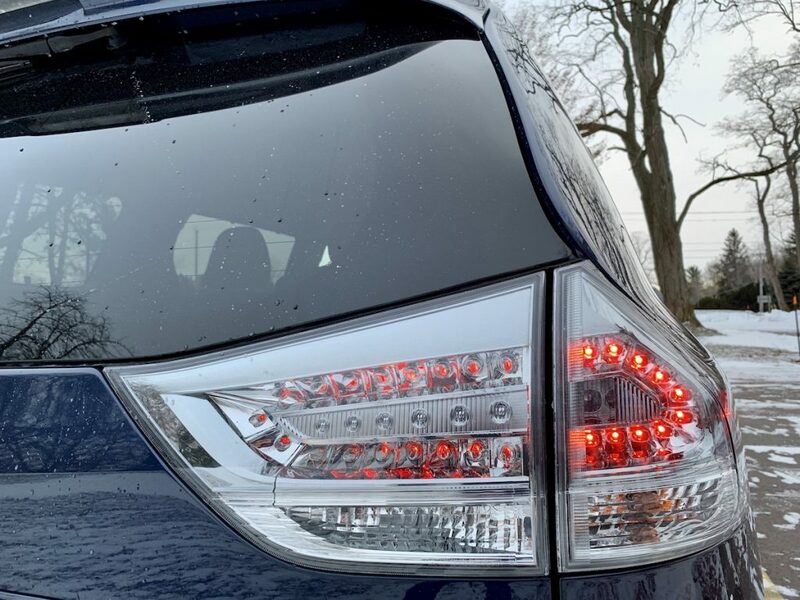 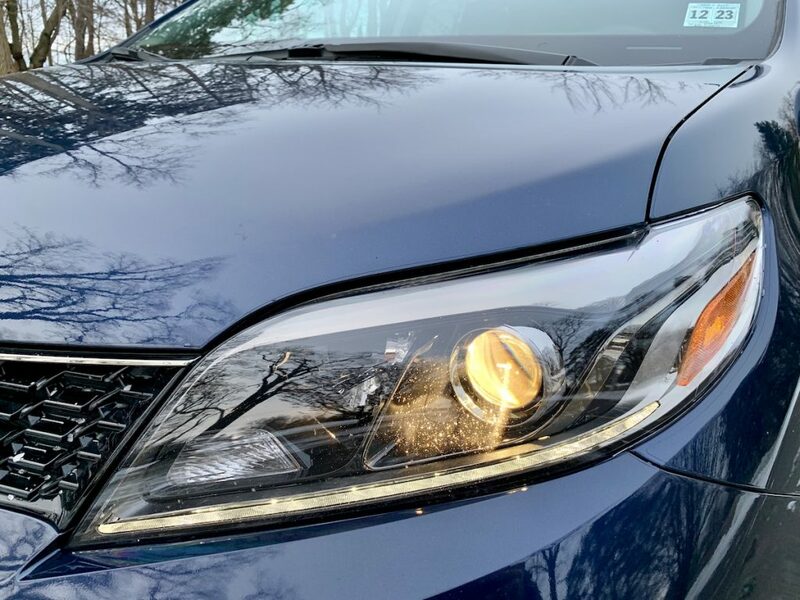 Toyota provided us with a 2019 Sienna SE Premium AWD in Parisian Night Pearl to evaluate and truly get a feel for why this continues to be a favorite among buyers who want to move the most for the least amount of dough. 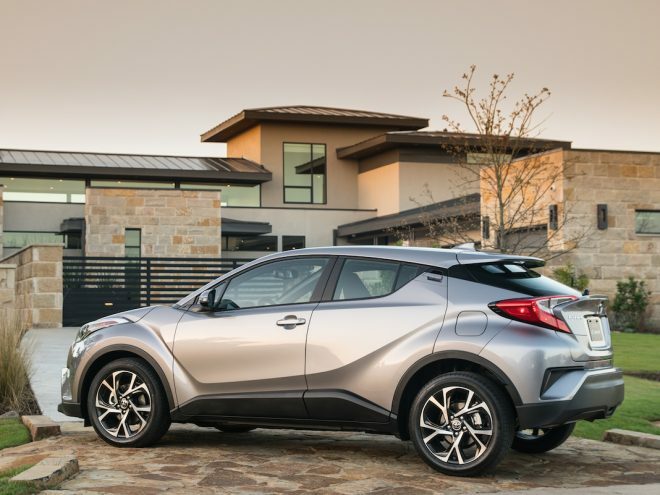 It’s a greater value proposition when it comes to moving people and their stuff with easier entry and exit. 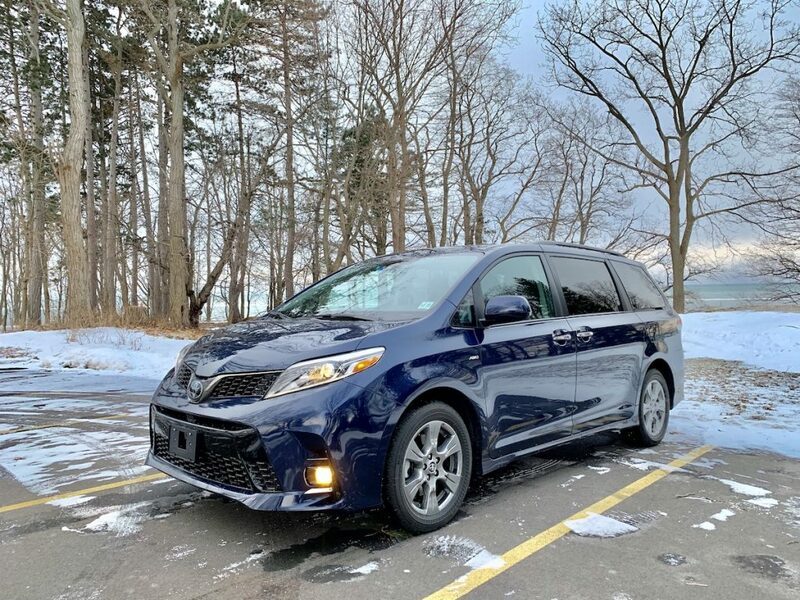 We’re happy to report that Sienna is still the only van in the segment offering all-wheel drive, and boy does it work well. 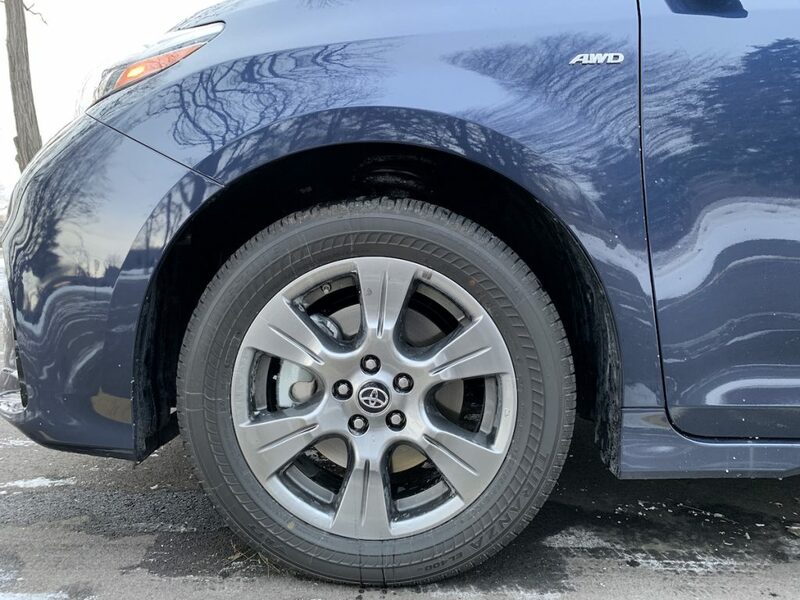 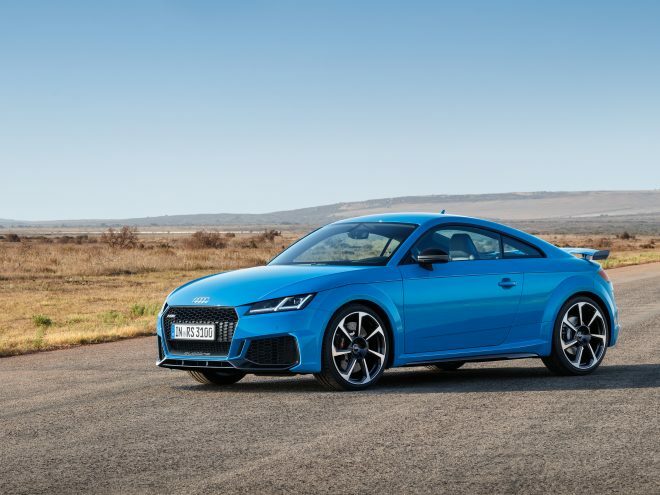 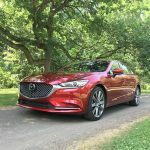 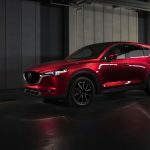 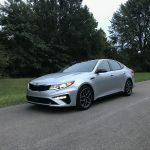 We have never felt so confident in an AWD vehicle, and we attribute it to the low center of gravity, active torque control, and heavier weight spread out across the platform. 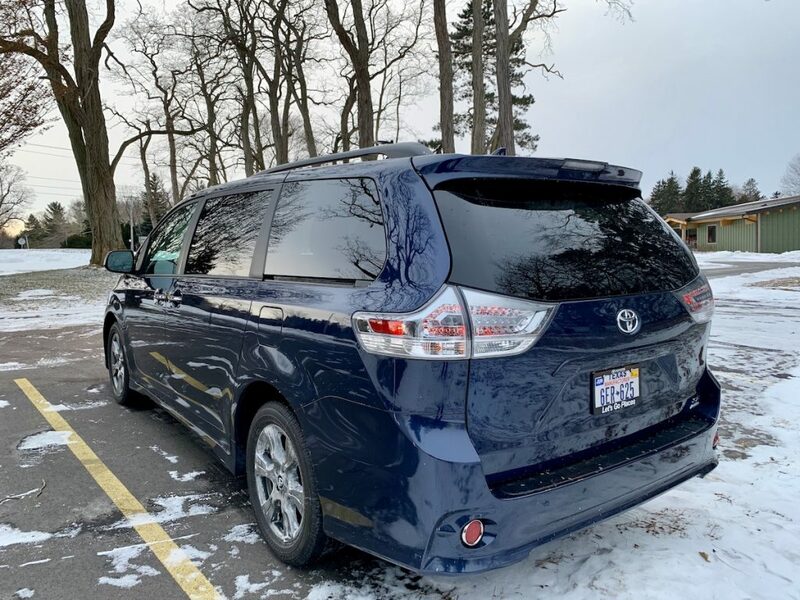 Even with all-season tires, this van handled snow and slush incredibly well. 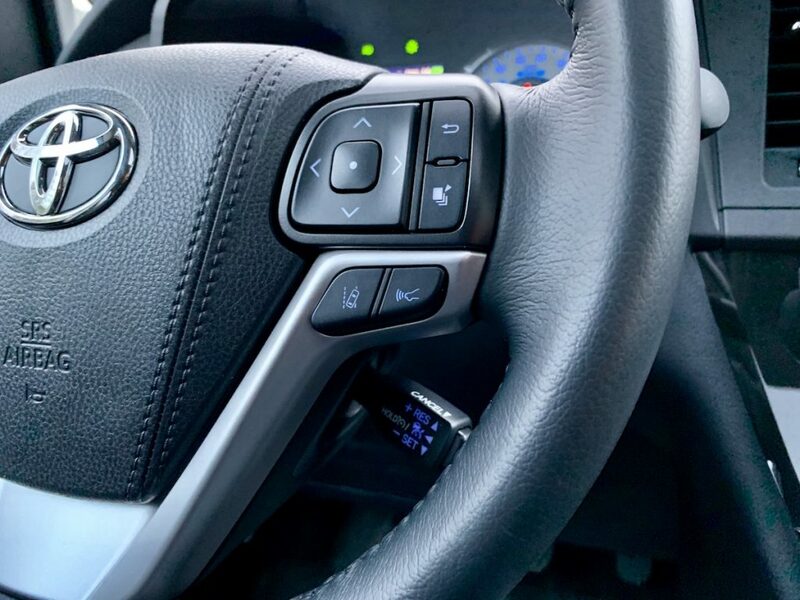 Sienna delivers peace of mind when merging and passing. 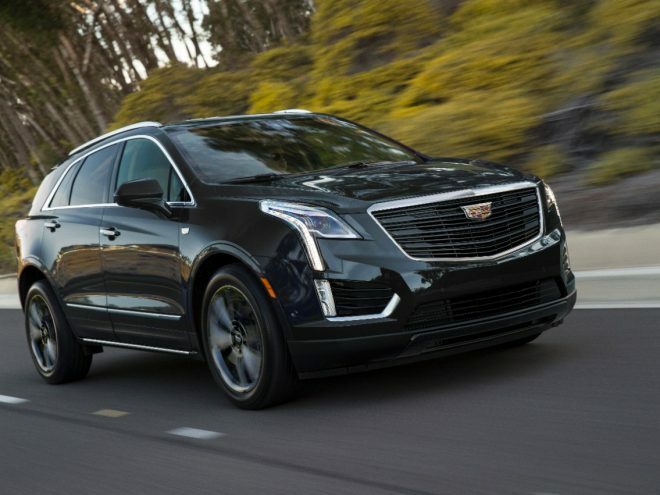 Its 3.5L V6 produces 296 horsepower and 263 lb-ft of torque. 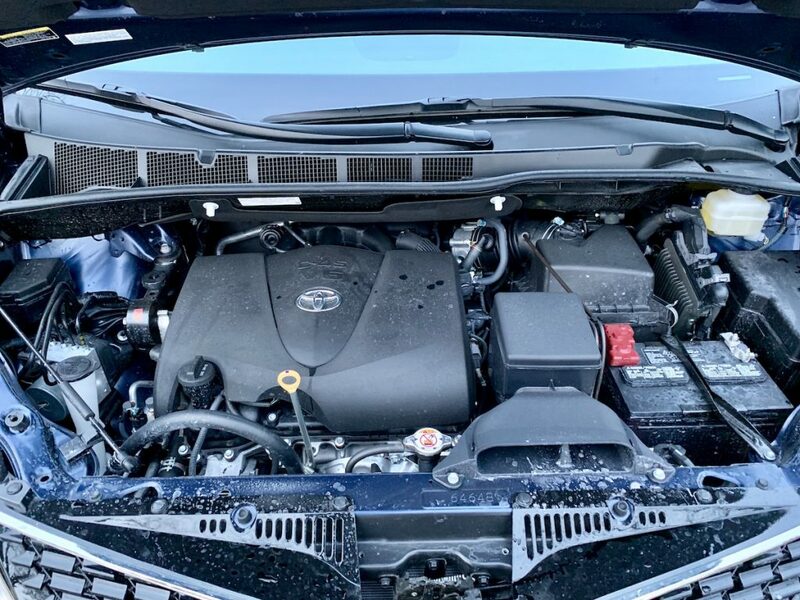 In perfect partnership with the transmission’s eight ratios, the V6 bestows the Sienna with quick acceleration and strong passing performance, downshifting quickly and sounding great working. 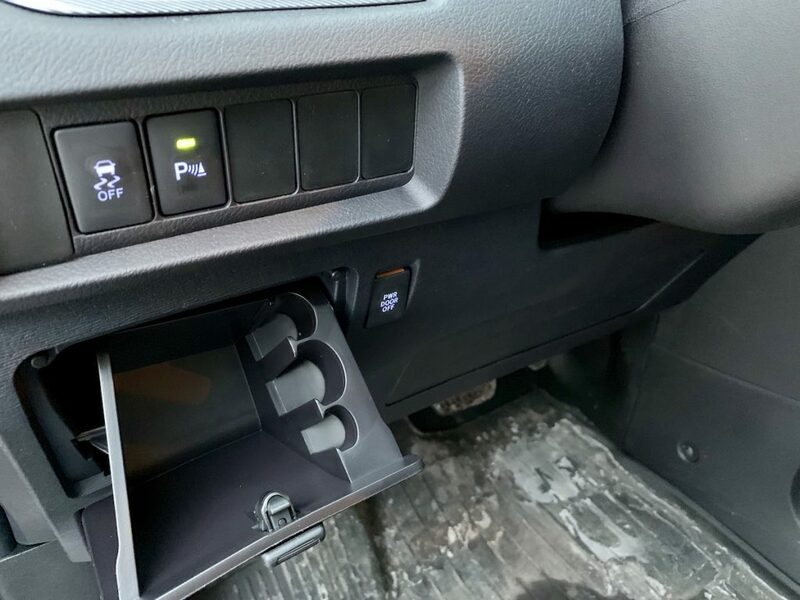 The transmission was recently revised and incorporates new advances to expand lock-up range and enhance efficiency. 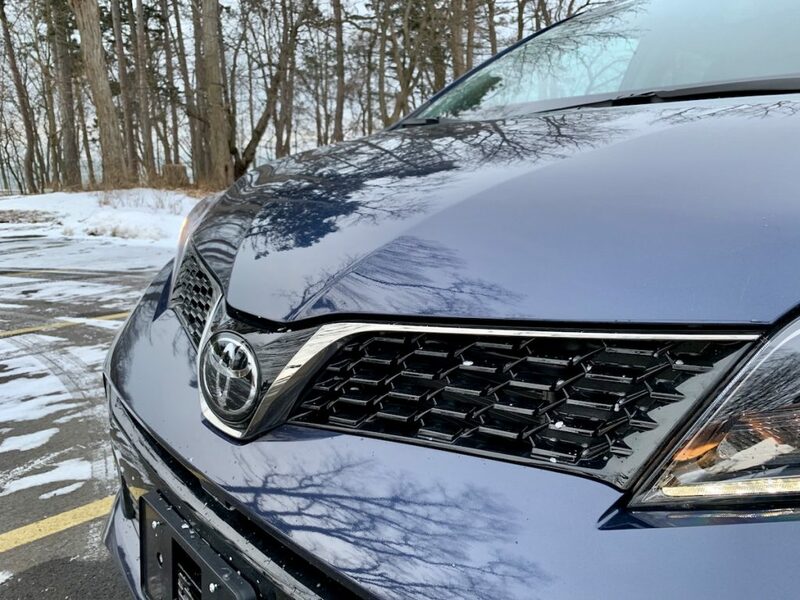 Combined with enhancements from the 3.5L engine, Sienna is EPA rated at 19 mpg city, 27 highway, and 22 combined for front-wheel drive variants. 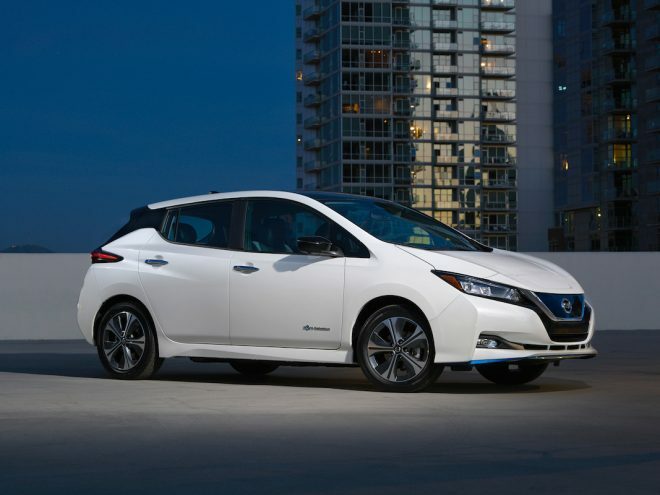 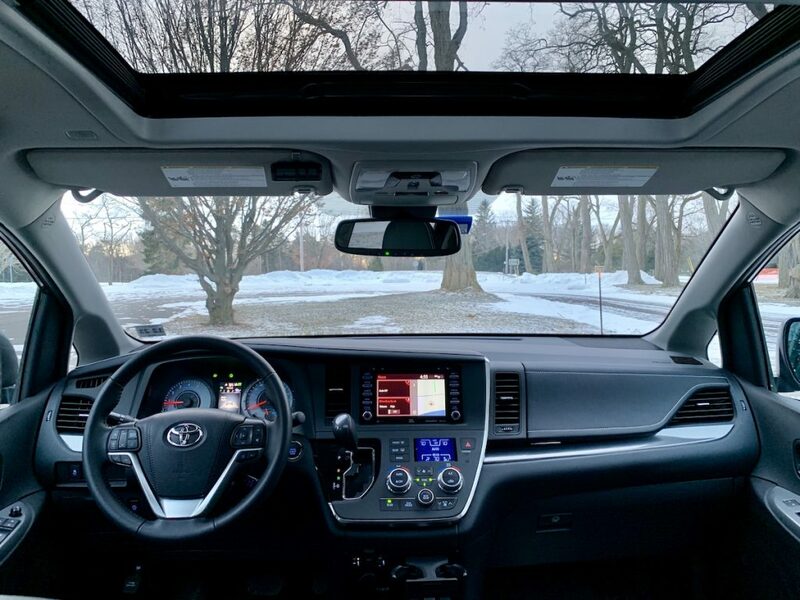 AWD models like our tester are rated 18/24/22. 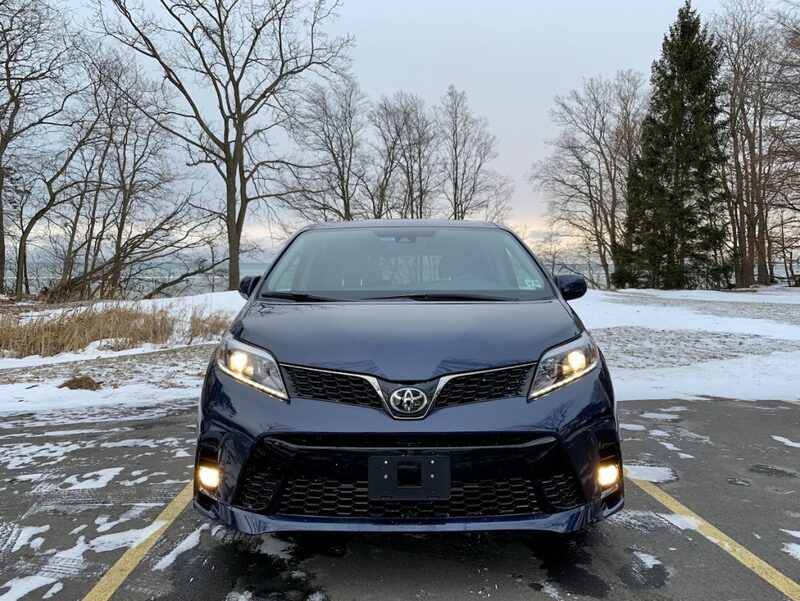 We averaged 22 mpg across a winter week of mixed driving. 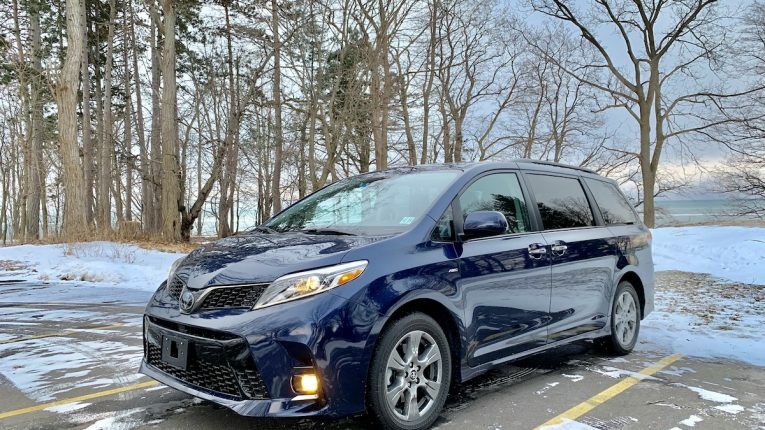 The standard Tow Prep Package which packs a heavy duty radiator, fan, and engine oil cooler allows the Sienna to pull a 3,500-lbs. 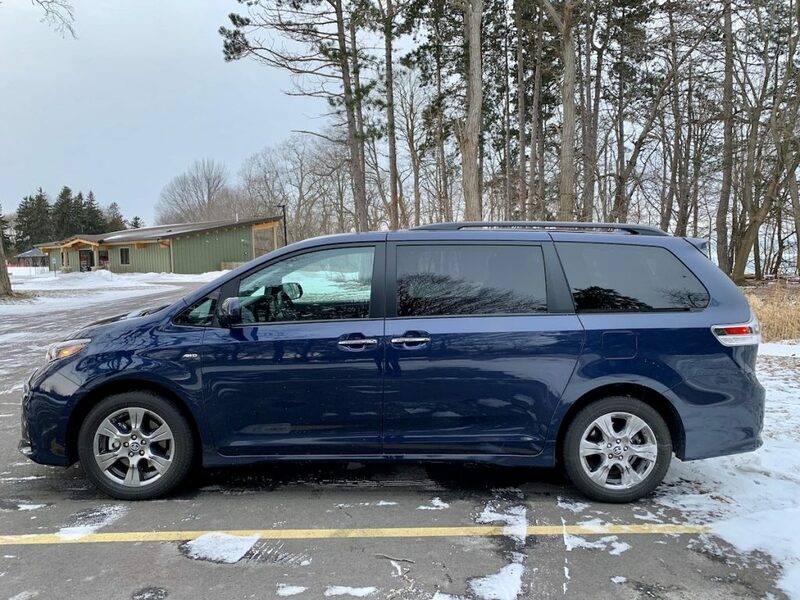 Toyota offers several trims of the Sienna, and we had the opportunity to evaluate the sportiest of them all: SE AWD. 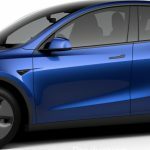 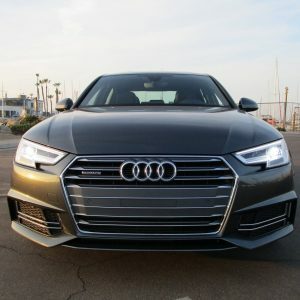 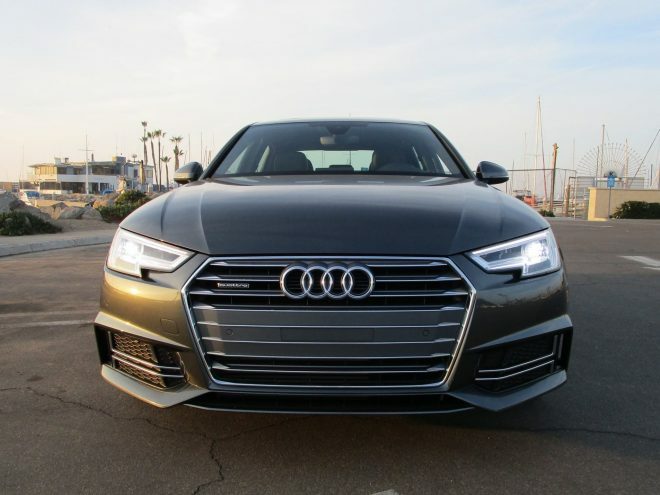 It brings stylish projector-beam headlights, LED daytime running lamps (DRL), sculpted side skirts, and smoke-look trim. 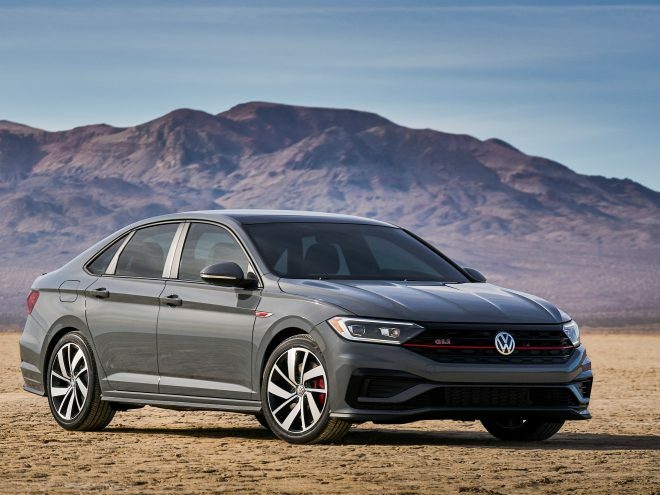 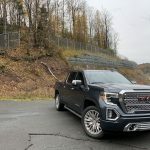 Its sportiness goes beyond just looks, though: it rides atop a sport-tuned suspension and exclusive 19-inch wheels and tires. 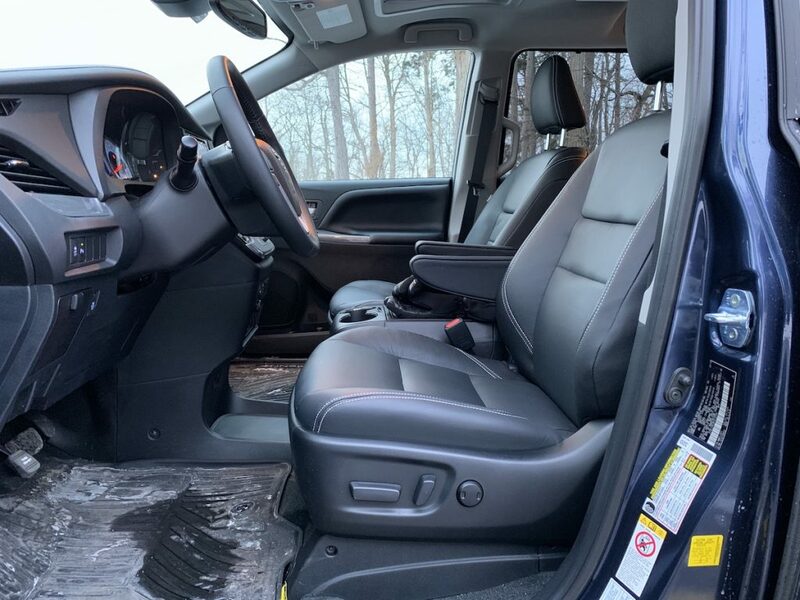 The combination of sportier underpinnings and footwear sharpens the van’s handling on twisty roads. 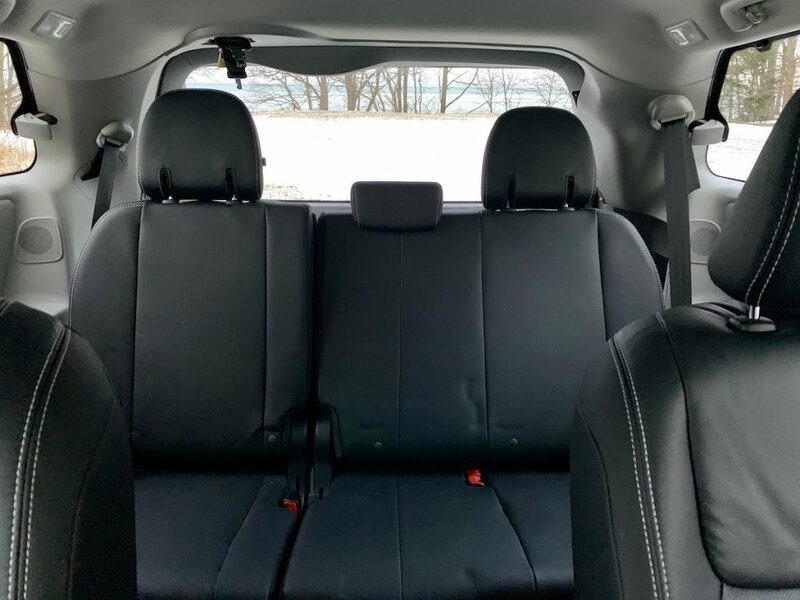 Inside, special instrumentation and heated and powered front leather-trimmed seats with white stitching complete the SE unique traits. 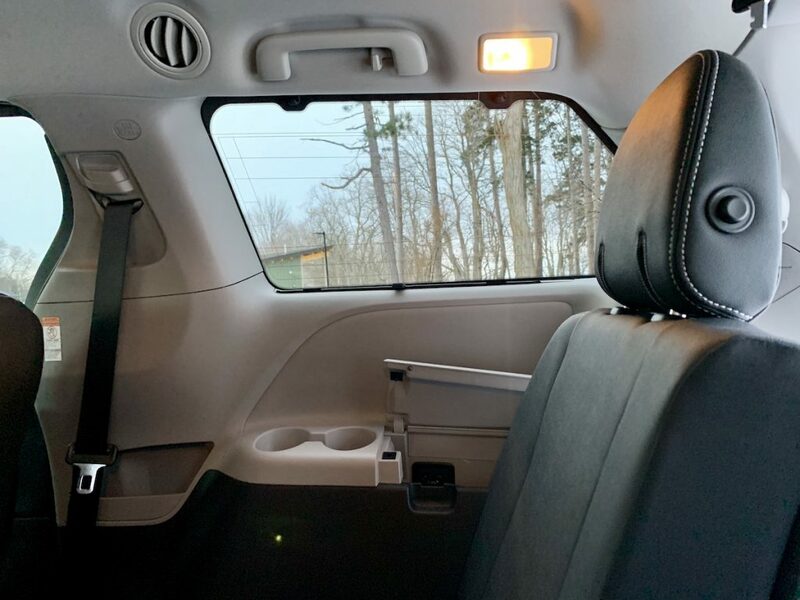 The second row captain’s chairs are fantastic for people that need their own personal space, sliding 23 inches rearward to reveal an enormous amount of legroom. 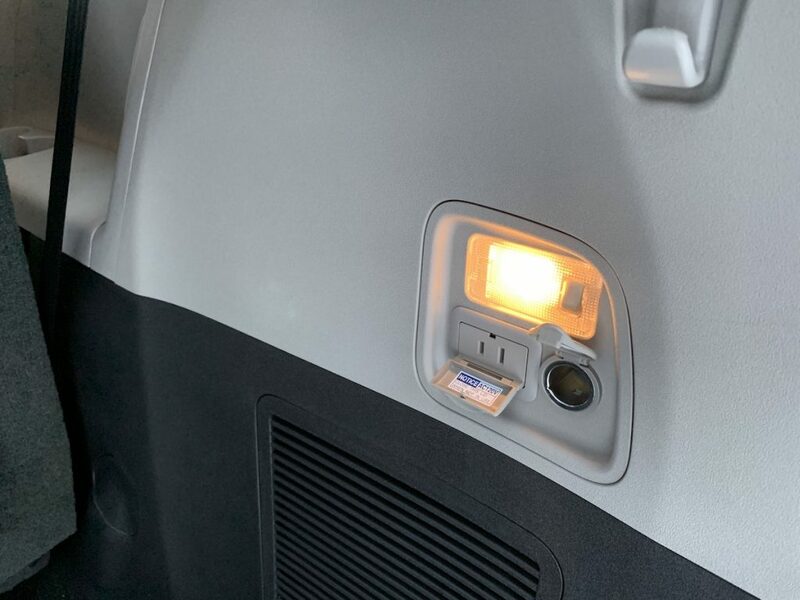 Sienna also still retains those magical stowable third row seats. 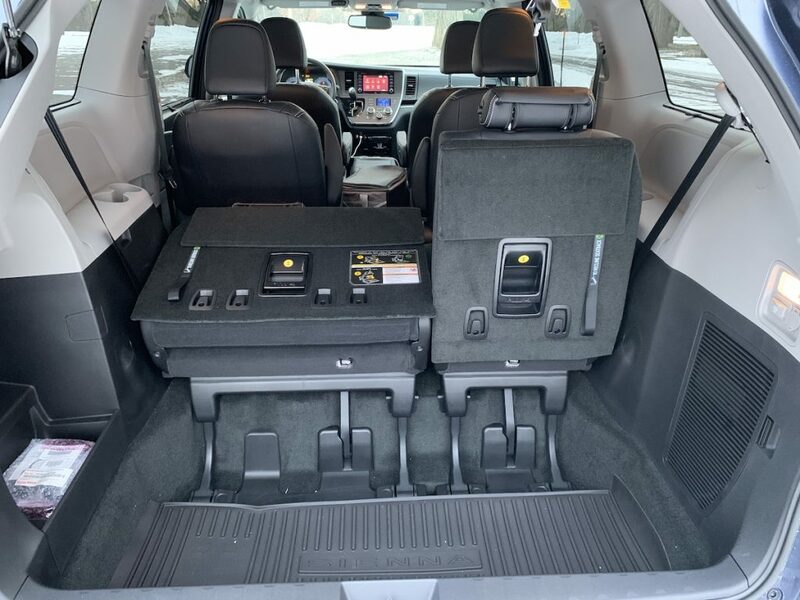 The spring-loaded design makes expanding the cargo area so effortless and faster than any power mechanism could. 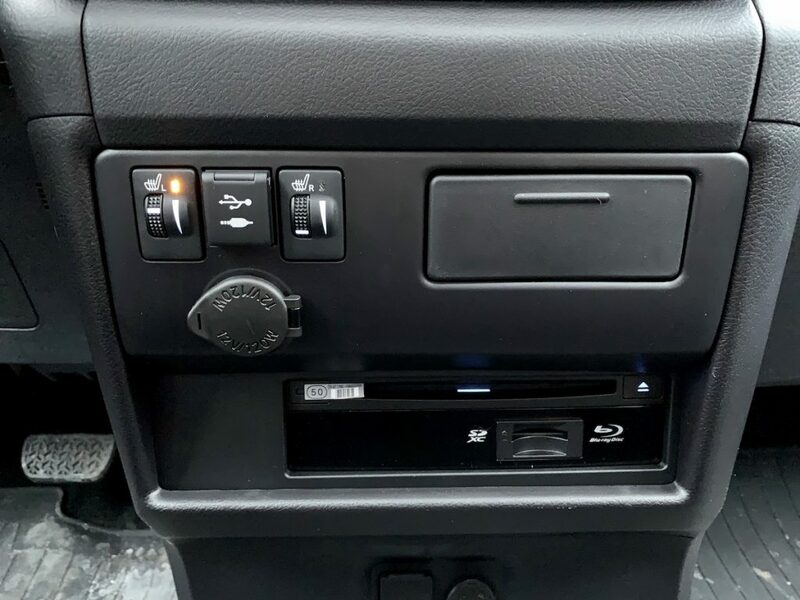 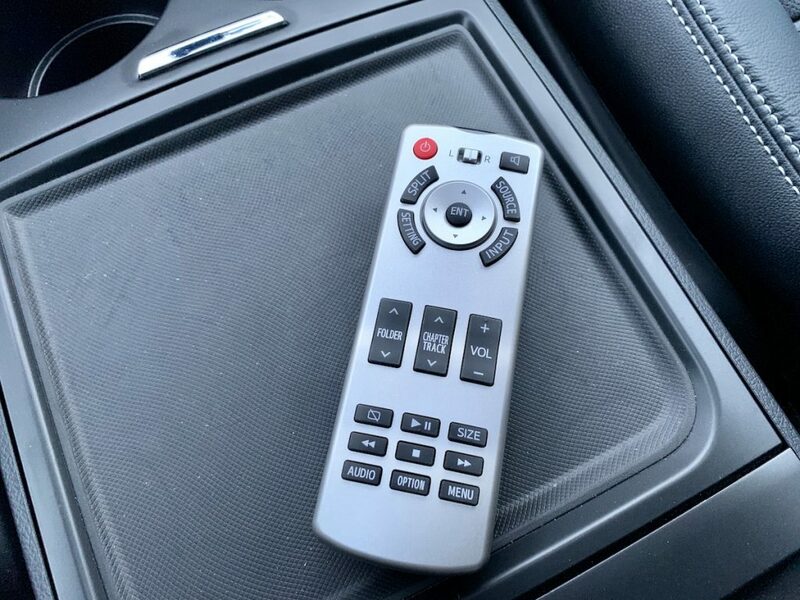 We’re huge fans of the simple, functional layout of all the controls the driver uses. 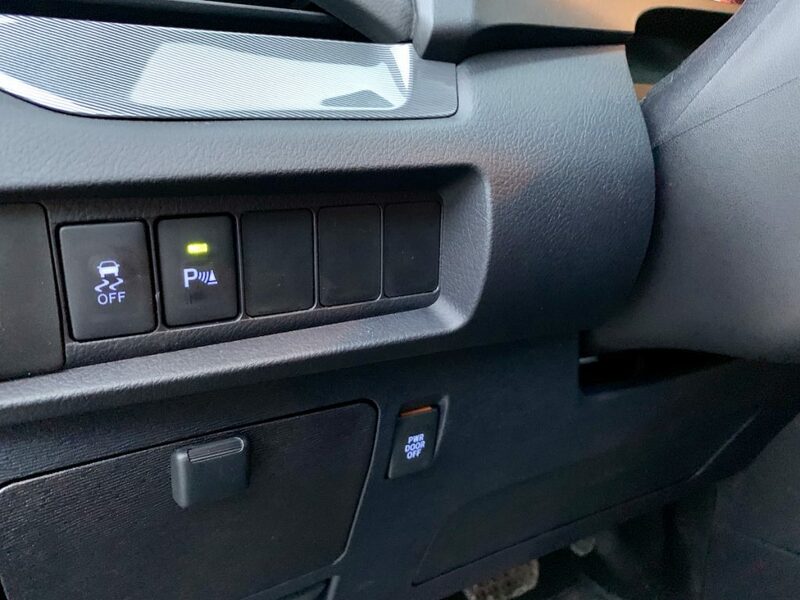 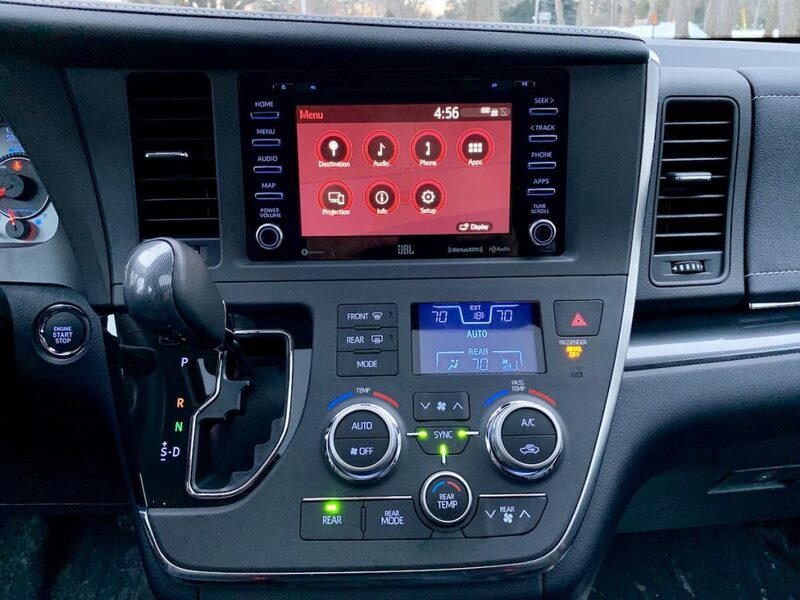 The Sienna team neatly groups climate control, gearshift, and multimedia buttons into their respective areas. 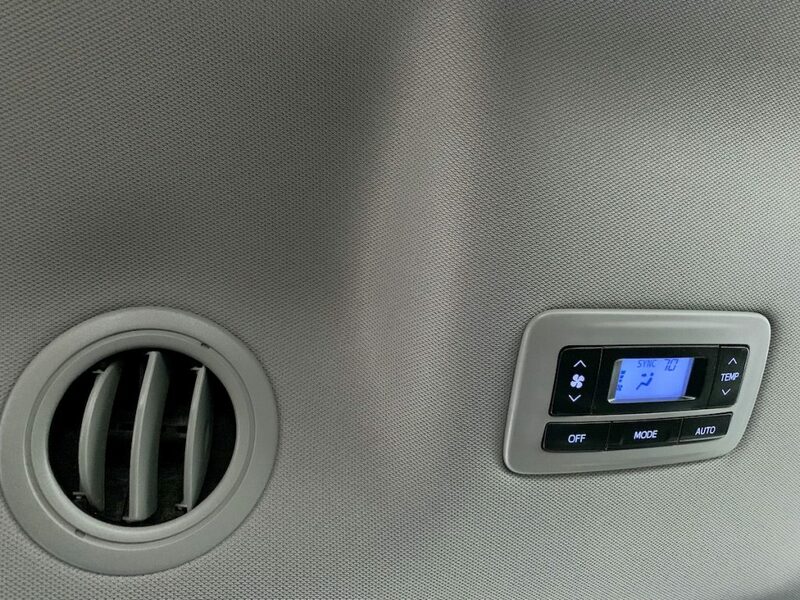 A Tri-Sync switch for the air conditioning allows the driver to manage temperatures in all three climate zones without a fuss, a huge help. 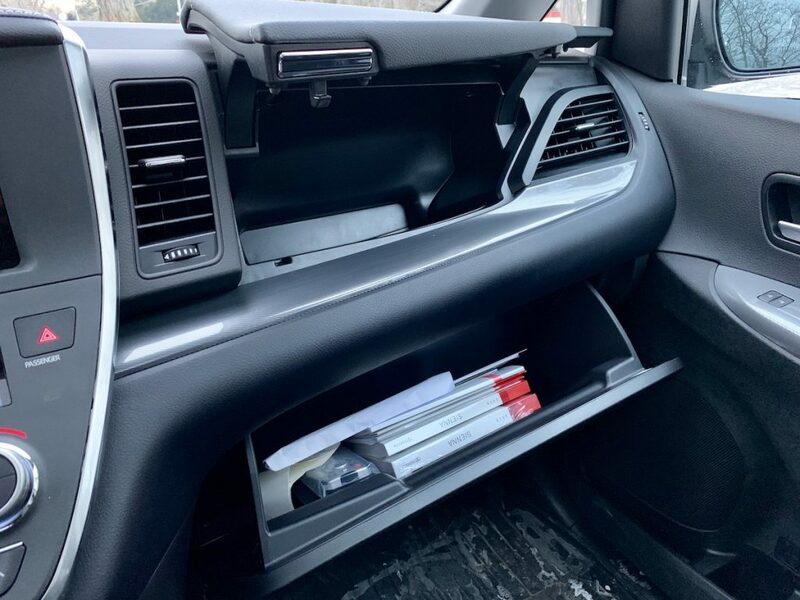 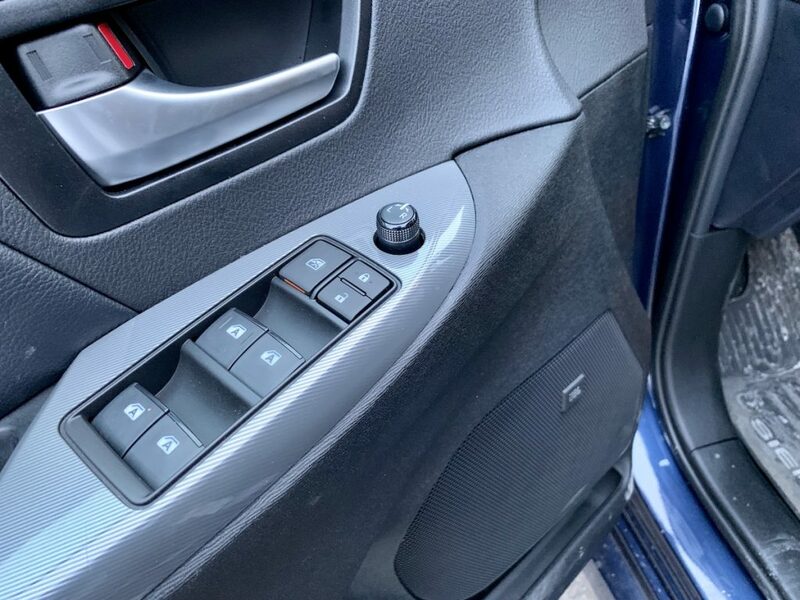 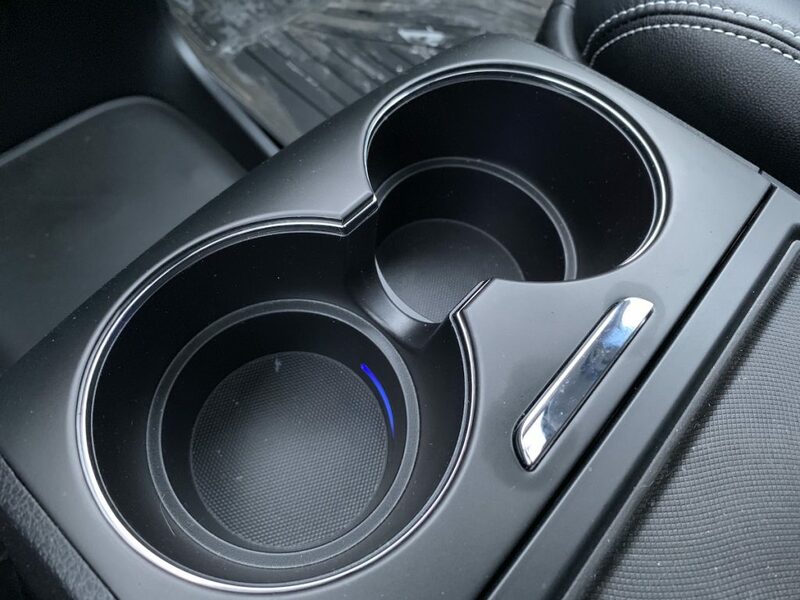 The available pushbutton driver’s seat center armrest can adjust to numerous positions, and can return to its last position even after it’s been stowed. 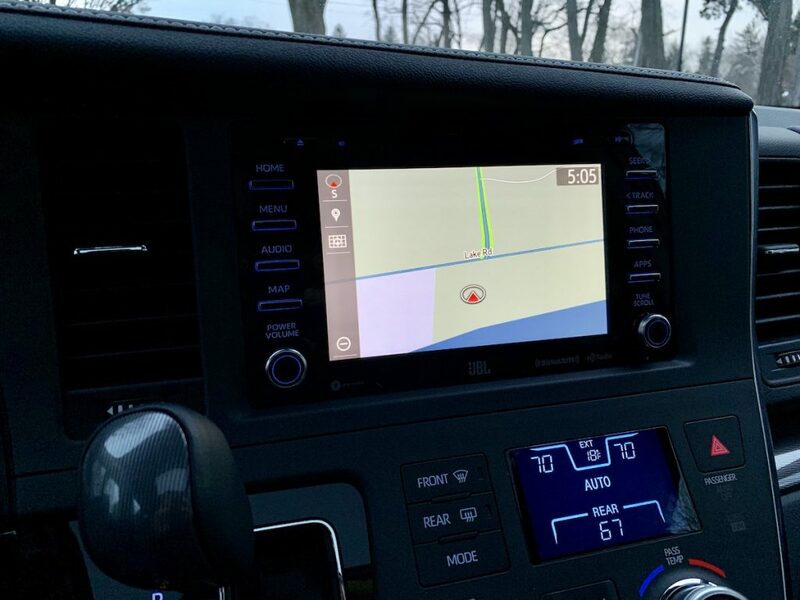 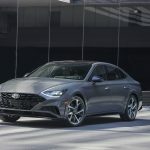 The 4.2-inch color screen between the tachometer and speedometer has just about everything a driver could want, from efficiency to tire pressure info, and even the AWD torque distribution. 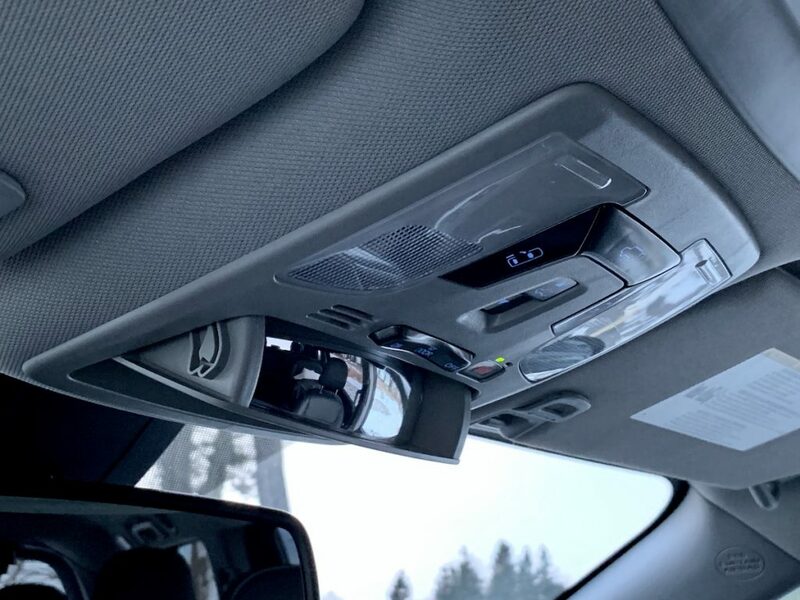 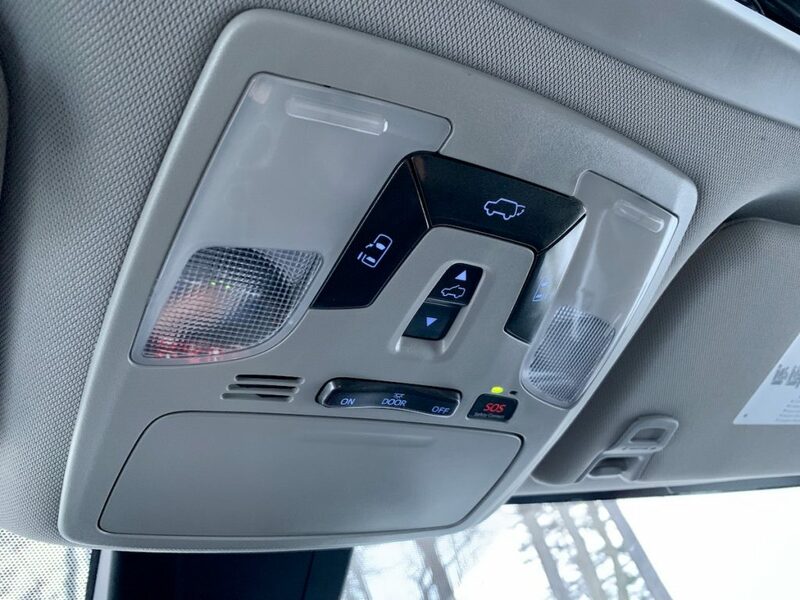 Anyone who’s tried talking to rear seat passengers will love the conversation mirror integrated into the overhead console. 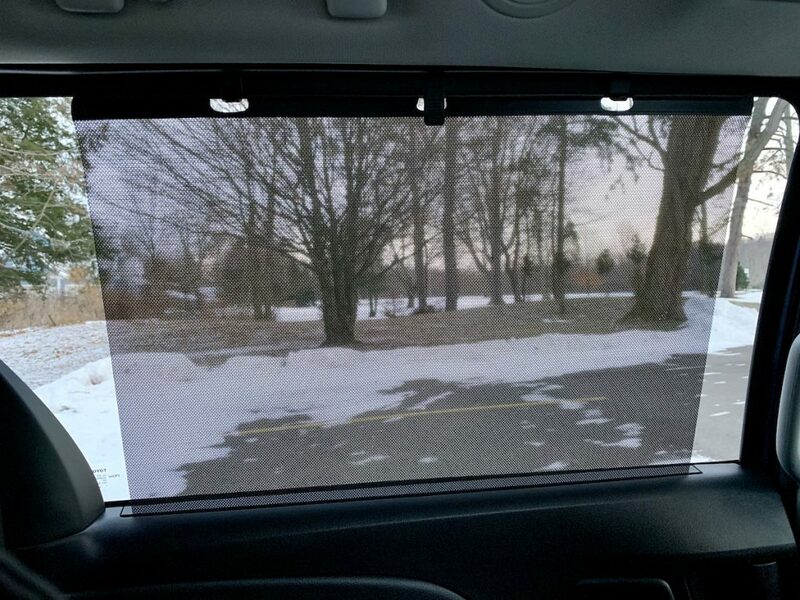 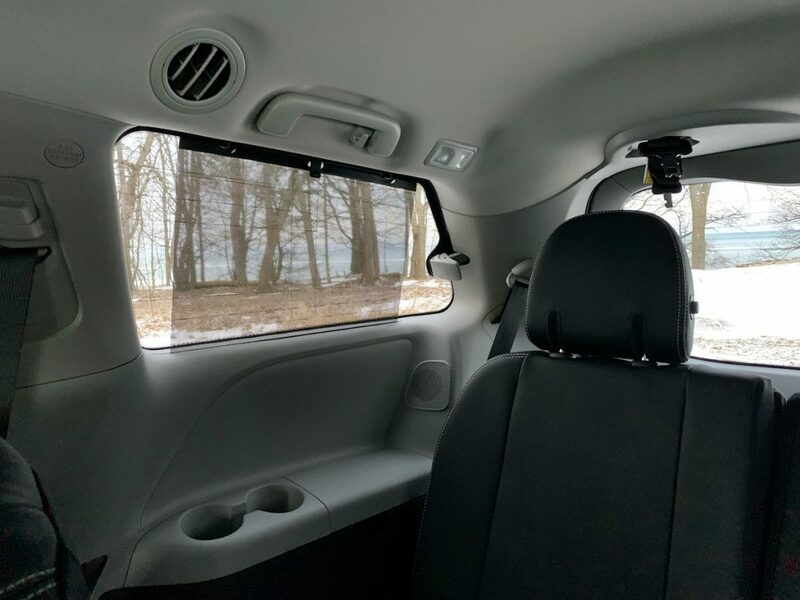 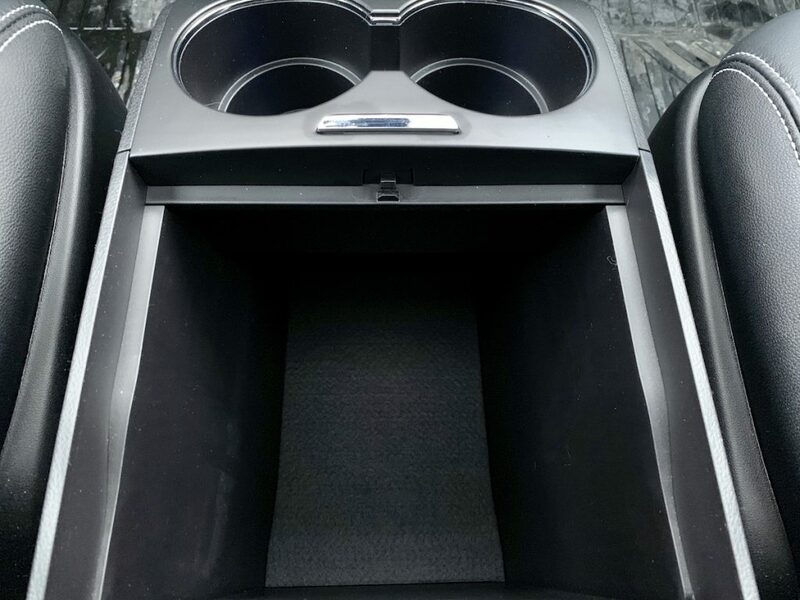 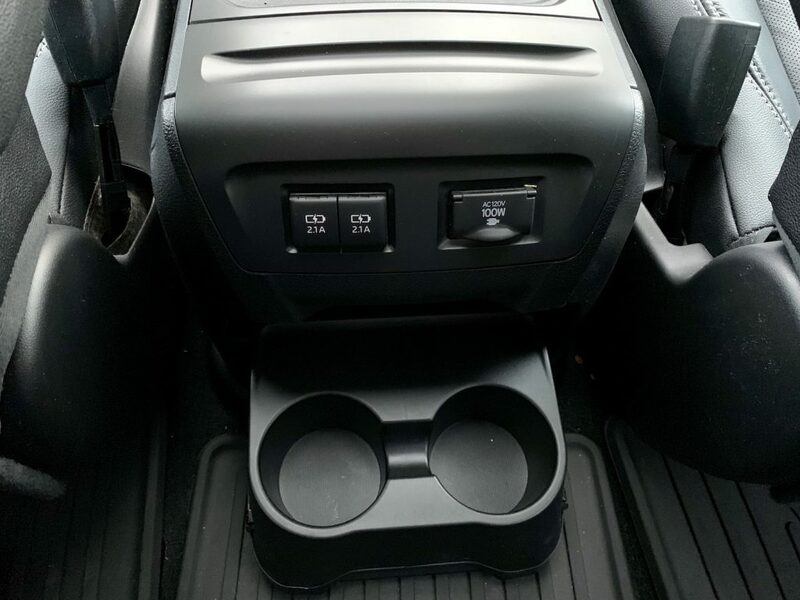 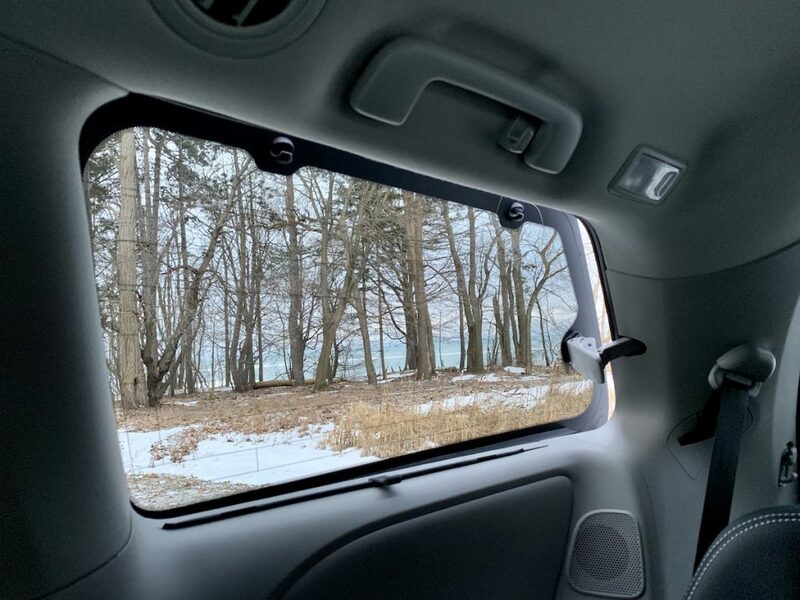 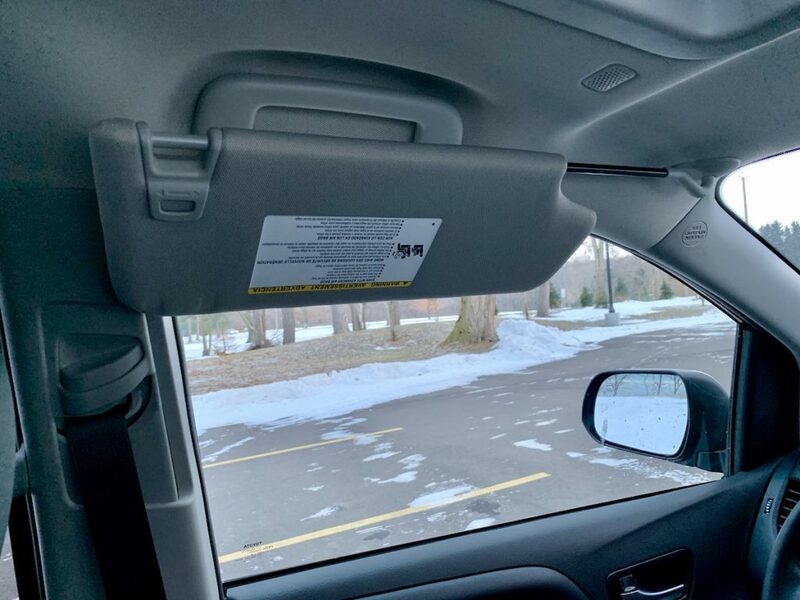 It gives the driver an all-encompassing view of rear passengers, and is taken to the next level with Driver Easy Speak, our favorite feature of all! 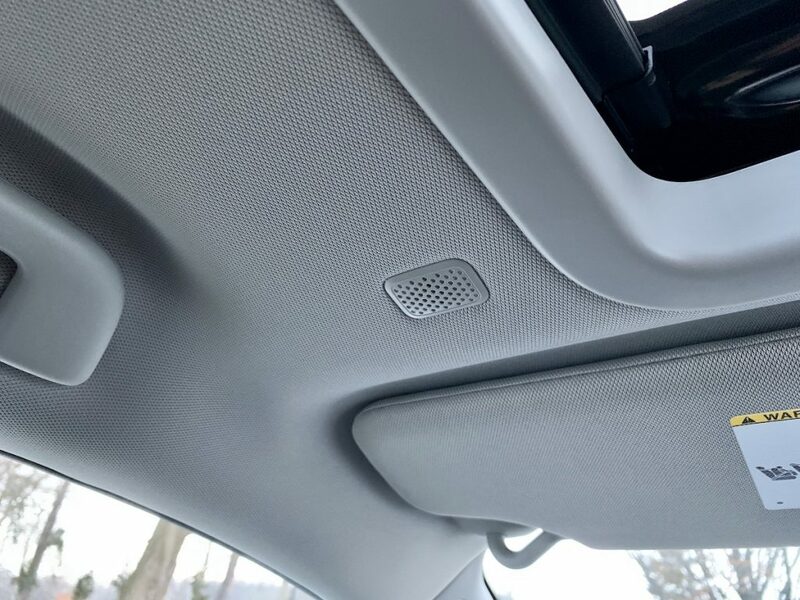 Using the microphone previously reserved for voice calls and interacting with the Entune system, Driver Easy Speak projects the driver’s voice through the rear speakers. 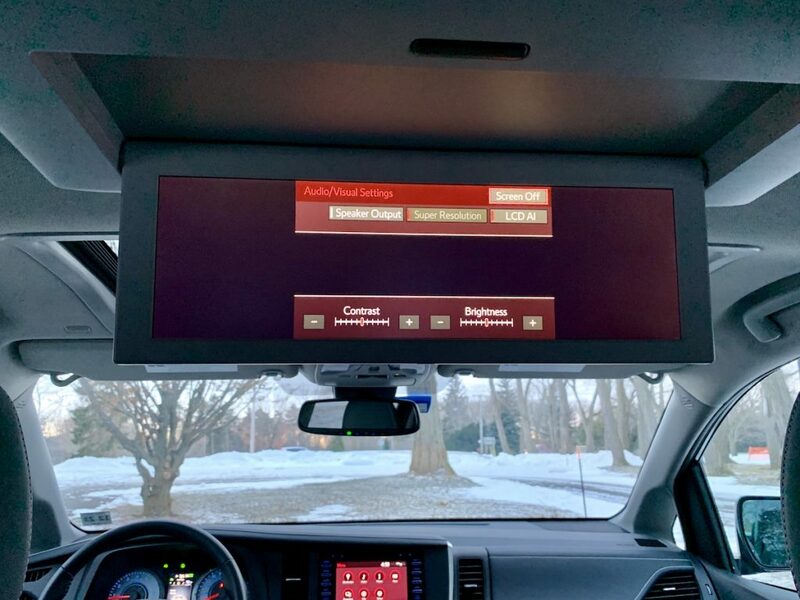 Our SE tester was also equipped with the fantastic Dual View Entertainment Center, which uses two viewable displays within a seamless 16.4-inch widescreen image. 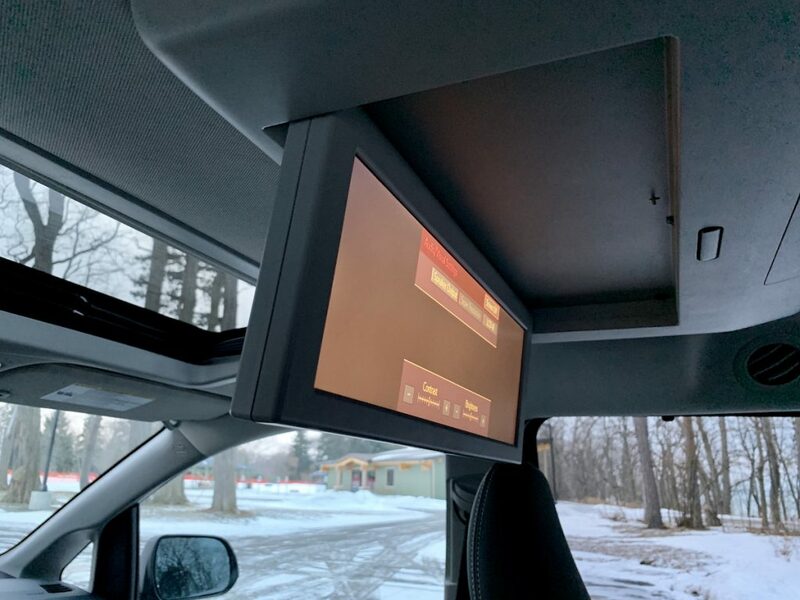 The system features Blu-Ray, an HDMI input, and an SDXC card reader that can play 10 different audio and video formats. 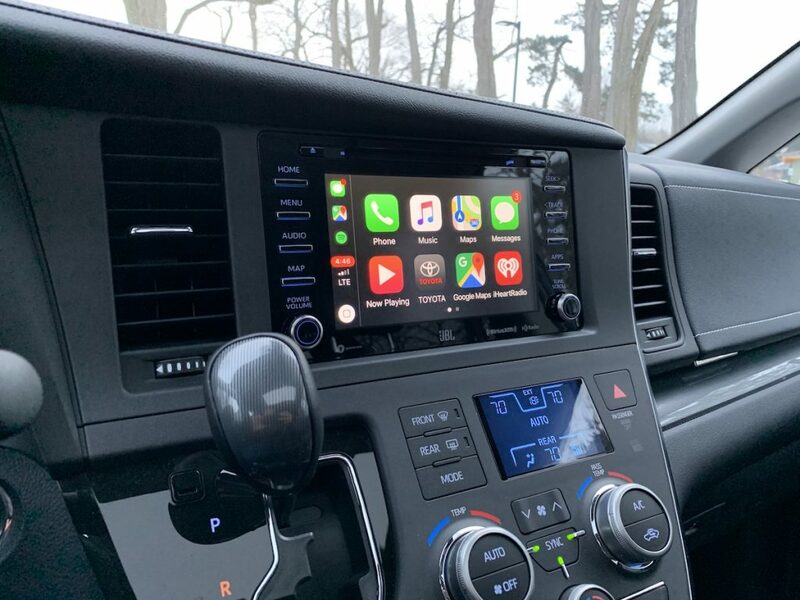 It can play from one or two separate sources as well, and includes a pair of wireless headphones and a remote control. 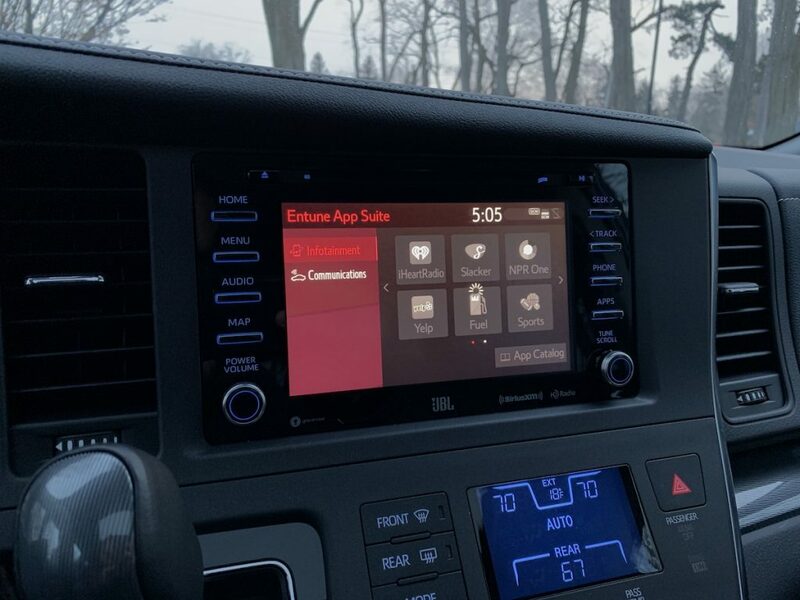 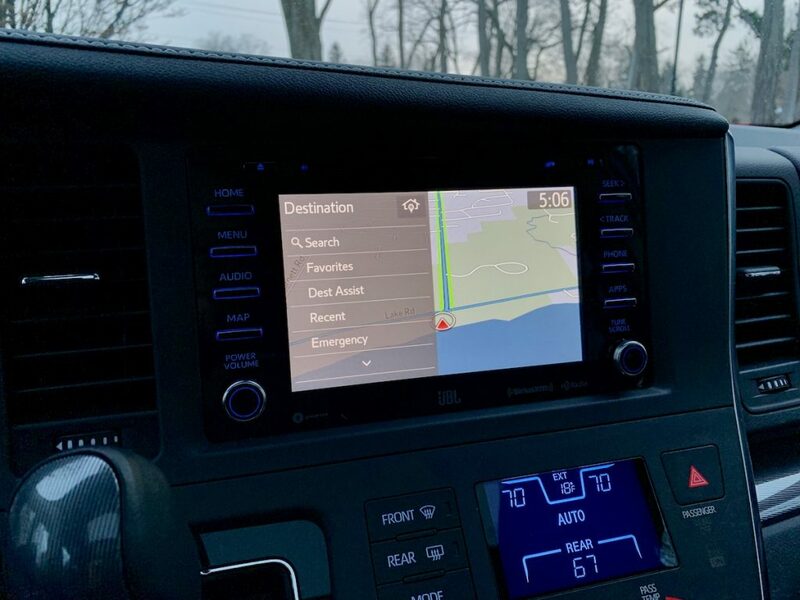 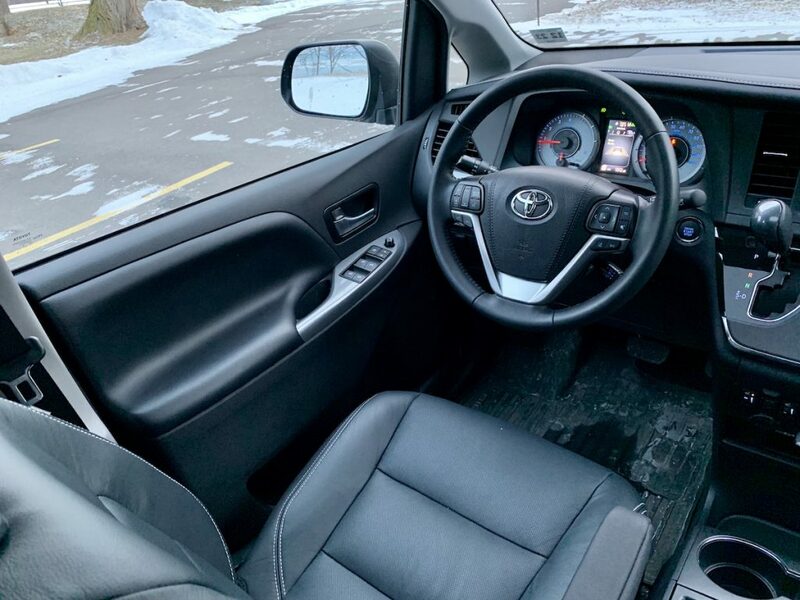 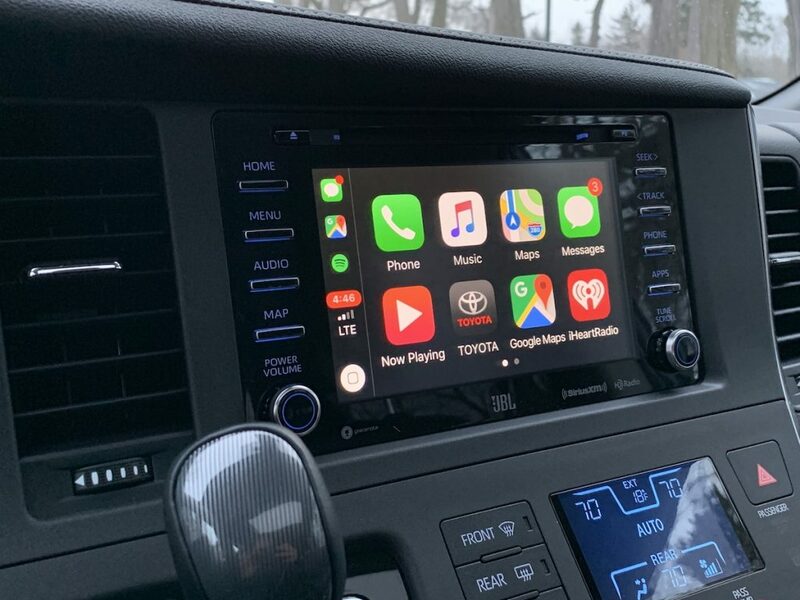 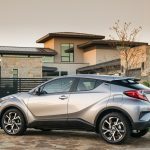 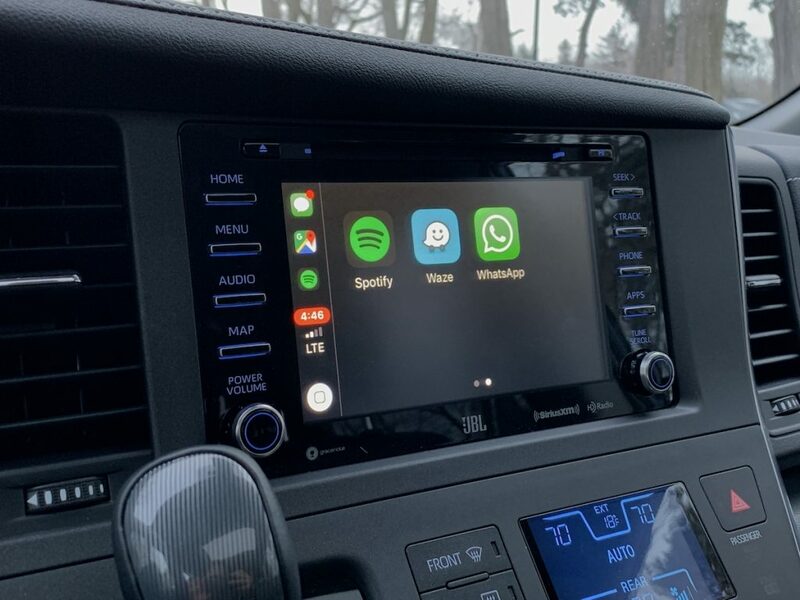 Sienna drivers will enjoy enhanced connectivity and entertainment through the new Toyota Entune 3.0 multimedia system on all models, offering an enhanced set of connected vehicle technologies. 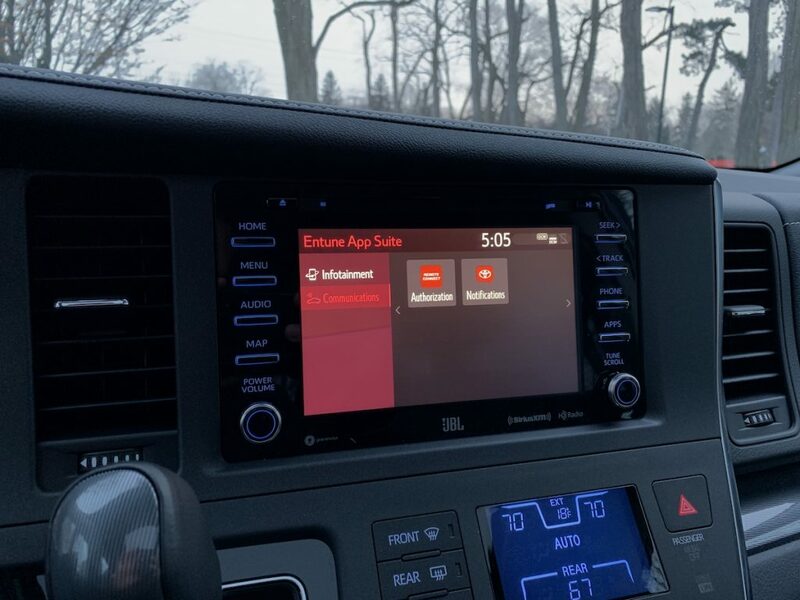 On the infotainment front, Entune Audio Plus is standard and includes Safety Connect and Wi-Fi Connect. 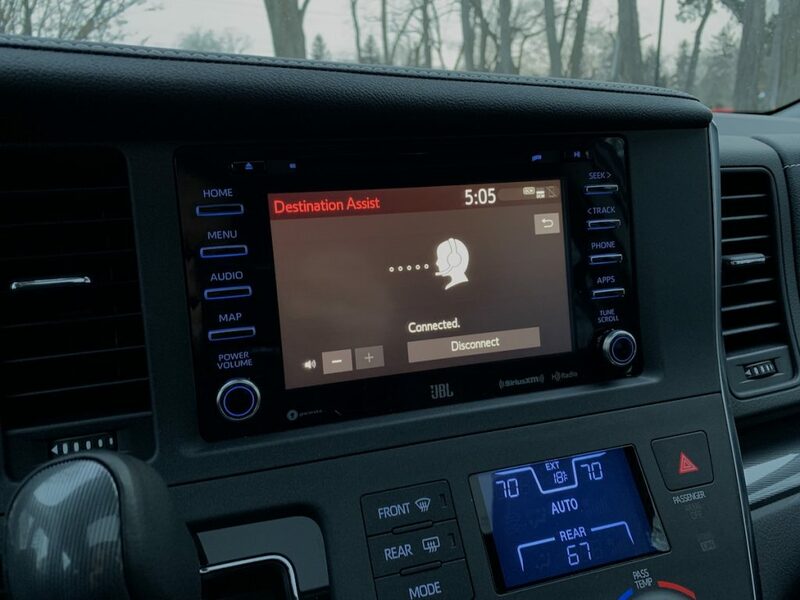 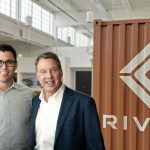 WiFi Connect will allow up to five mobile devices to connect using 4G LTE. 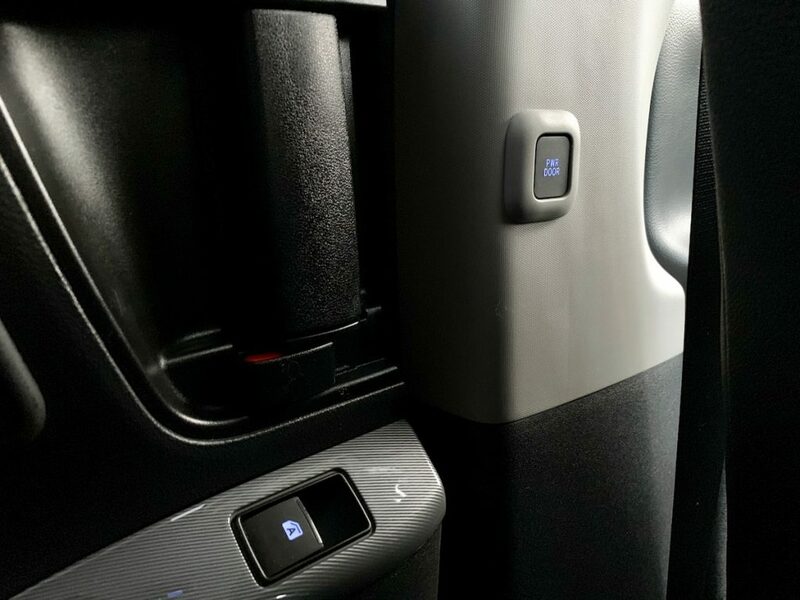 Five USB ports across the three rows are also standard. 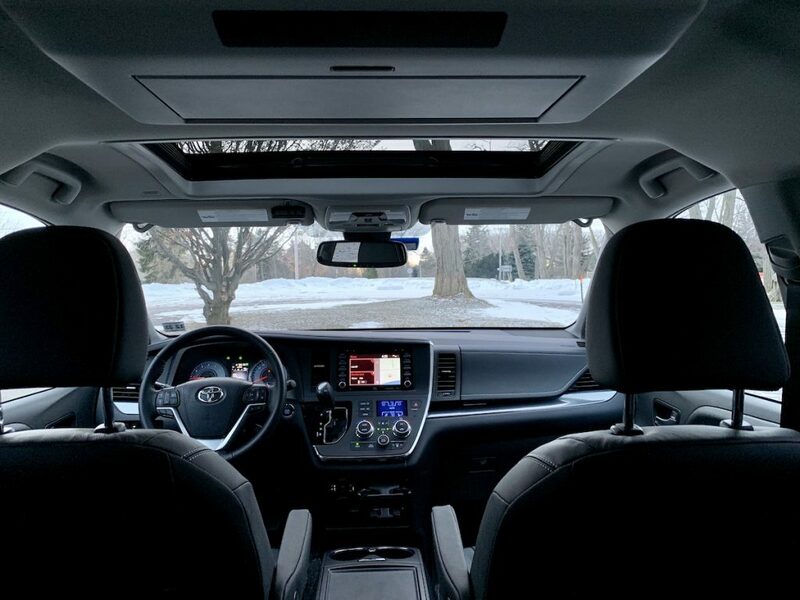 Parents will appreciate all the safety tech, from Blind Spot Monitor with Rear Cross Traffic Alert (perfect for parking lots), to TSS-P which is an advanced active safety suite bundling Pre-Collision System with Pedestrian Detection, Full-Speed Range Dynamic Radar Cruise Control, Lane Departure Alert with Steering Assist, and Automatic High Beams.